Tackling the world’s most prestigious cycling race is certainly a big undertaking—even for those of us who are not competing. With the Tour de France underway, we wanted to find the best and most iconic spots to visit along the route and struggled to pick just five. Stage stops change every year (with the exception of the mountain chains in Pyrenees, Alps, and the finish line) so we picked our favorites from the 2014 course and offered suggestions on what to see and do. As home to some of the most famous champagne houses in the world—Moet & Chandon, Esterlin, Mercier, Boizel, to name a few, this small town is less than two hours away from Paris and perfect for a romantic getaway. To feel like you’re on your own TDF, take a bicycle tour of the Champagne vineyards with L’Echappee Bulles. Unknown to many tourists, the capital of Franche Comte boasts Roman ruins, a UNESCO world heritage city, amazing museums, and a Renaissance palace. Visit “little Louvre” Musee des Beaux Arts without the Parisian crowds. Known as the “Capital of the Alps,” Grenoble was the host for the 1968 Olympic Winter Games and is now a major city destination. Take the cable car up to the historic Bastille for panoramic views of the city overlooking the Isere River. If you’re looking for the complete adventure experience, Luchon is the ultimate destination. From white water rafting in the summer to skiing in the winter, Luchon has it all. Bike through the Pyrenees (at your own pace) and then relax at any of the thermal baths and spa resorts in the area. 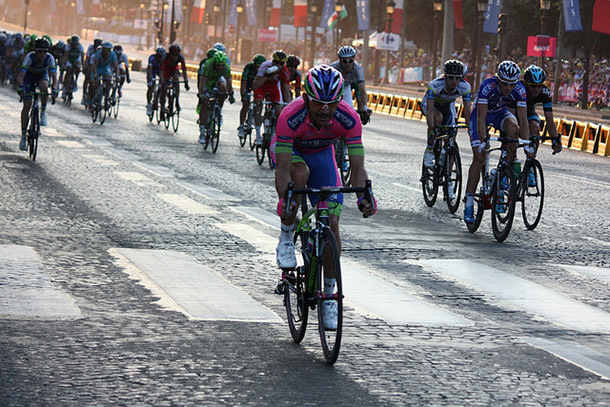 As the final circuit since 1975, the Champ-Elysees sets the tone for the end of the grueling race. This year, Paris will celebrate the 70th Liberation of Paris (during WWII) throughout August. Must sees: While there’s endless possibilities in the city of light, follow our “what not to do” guide to make the most of your holiday.